Our vessels at Kawau Cruises have been given a Pest-free Warrant by DOC and Auckland Council, showing we are meeting biosecurity standards for visiting pest-free islands and other islands in the Hauraki Gulf. Make sure all food is packed and sealed in plastic containers with lid. Ensure cardboard boxes are closed and taped – there must be no opportunity for an unwanted pest to access the container/box in transit. Thoroughly check any camping or overnight gear for stowaways. Gear that has been stored away is high risk. Without your co-operation your trip may not be able to take place, so if you have any doubts or questions about biosecurity, please ask us. 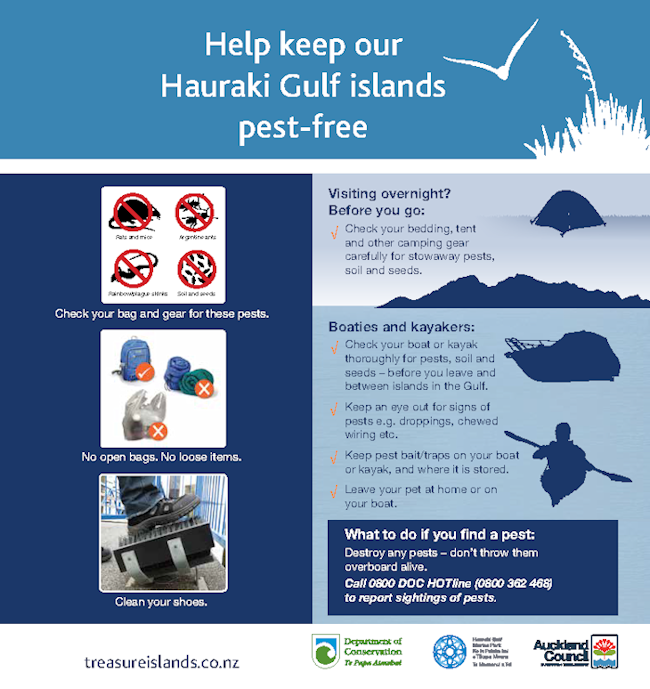 Visit www.treasureislands.co.nz for further information on biosecurity in the Hauraki Gulf. Ever wanted to explore an island that has no road access? Want to learn more about the people living there? This is your opportunity, with the Royal Mail Run Cruise!